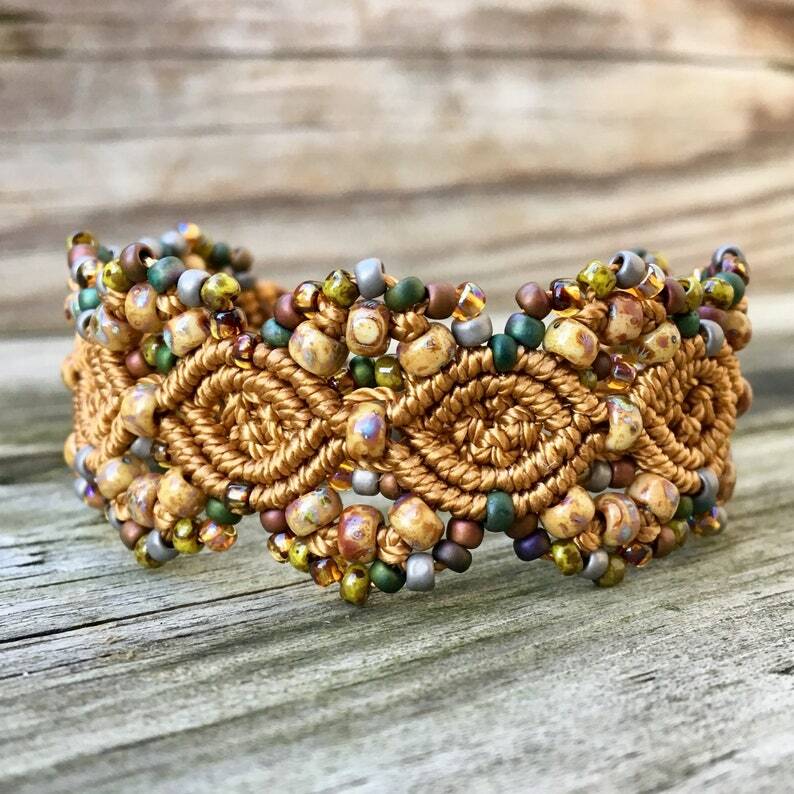 This cuff bracelet was made with 5 strands of gold colored nylon cording knotted together in a double half hitch knotted macrame pattern with different sizes and shapes of Miyuki Picasso style glass seed beads. This cuff is lightweight and easy to put on and take off. It measures 6 and a half inches at the smallest size and will fit a wrist size up to 8 1/2 inches. The closure used to secure this bracelet is an antique copper lobster clasp and extender chain. Micro-Macrame Cuff Bracelet. Modern Macrame. Beaded Cuff. Black Cuff Bracelet. Macrame Cuff. Statement Jewelry. Boutique Fashion Piece. Micro-Macrame Cuff Bracelet. Modern Macrame. Beaded Cuff. Lilac Cuff Bracelet. Macrame Cuff. Statement Jewelry. Boutique Fashion Piece. Micro-Macrame Cuff Bracelet. Modern Macrame. Beaded Cuff. Green Cuff Bracelet. Macrame Cuff. Statement Jewelry. Boutique Fashion Piece. Micro-Macrame Cuff Bracelet. Modern Macrame. Beaded Cuff. Silver Cuff Bracelet. Macrame Cuff. Statement Jewelry. Boutique Fashion Piece. Micro-Macrame Cuff Bracelet. Modern Macrame. Beaded Cuff. Red Beaded Bracelet. Red Macrame Cuff. Statement Jewelry. Boutique Fashion Piece. Micro-Macrame Cuff Bracelet. Modern Macrame. Beaded Cuff. Pink Cuff Bracelet. Macrame Cuff. Statement Jewelry. Boutique Fashion Piece. REDUCED. Micro-Macrame Cuff Bracelet. Modern Macrame. Beaded Cuff. Yellow Bracelet. Macrame Cuff. Statement Jewelry. Boutique Fashion Piece. Micro-Macrame Cuff Bracelet. Modern Macrame. Picasso Beaded Bracelet. Neutral Beaded Cuff. Statement Jewelry. Boutique Fashion Piece.